LEXAN™ THERMOCLICK™ Sheet system products are mainly used in profile-free facade applications. 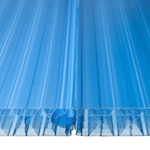 They are made up of 40 mm, UV-protected, multiwall sheet panels with a profiled tongue and groove connection. This interlocking system eliminates the need for vertical profiles, saving money and enhancing aesthetics as a result. Exceptional rigidity and thermal insulation.